Adding a step to your Sequence consists of both scheduling the step and then configuring the settings of that step depending on the type of step you’re adding to your Sequence. Scheduling a step means stipulating when a step needs to fire in your Step and Date Sequences. 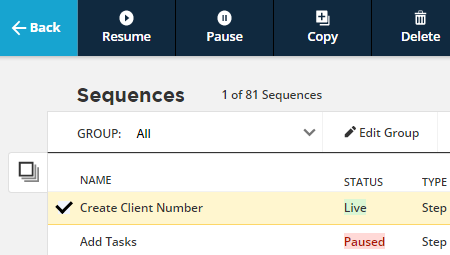 In Step Sequences, steps are scheduled according to when a contact was added to the Sequence whereas in a Date Sequence, steps are scheduled to fire either on a specific date or the date of a specific event. For both Sequence types you’ll need to set the time that each step fires. If you don’t schedule a time for your steps on a Sequence, the steps will fire at 10:00 AM in the account's time zone. What is the "account's time zone"? The account's time zone is that set by the Administrator's account. 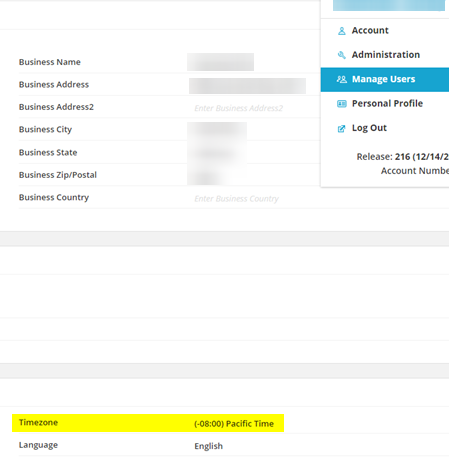 To find it in your account, click your email address at the top right, then select Manage Users and open the Administrator's account to see the time zone. Every type of step has different settings to configure before you save them. An email step requires a stored email to be selected while a rule step requires you to select an outcome to occur for the moment a contact reaches that step on the sequence, and so on. The proper way to configure each type of step is discussed below. Click on a type of step to add it and open the step settings. Find the Schedule Step section. An Email step is shown. Here you can select either an exact time or zero delay, a delay based on minute amount, or a delay based on hour amount. Steps with a delay in minutes or hours are processed at the top or bottom of the hour (:00 and :30). The step will delay at least the number of minutes or hours specified, but may activate up to 29 minutes after the delay is over. For example, if a Contact lands on a step delayed for "15 Minutes" at 3:01 PM, the step will activate at 3:30 PM, 29 minutes later. If the Contact lands on the step at 3:15 PM instead, the step will activate at 3:30 PM, 15 minutes later. Find the Schedule Step section. Select a from number. These are the SMS numbers you have set up in your account. When you add a Step to the end of an active Step Sequence, the question may arise: “what happens to those contacts who have already hit the last step on that Sequence?.” Below are a few scenarios to demonstrate the different outcomes that can occur in this situation. The variables here are your contact’s proximity to the last Step as well as when you set the new step to fire. Contact is at end of Step Sequence. You add a Step to go out immediately. Step fires the next day at 10 AM in the account's time zone. Last Step for contact fired two hours ago. You add a Step set to go out one hour after the previous Step. Step fires at 10 AM in the account's time zone the next day. Note: The "Immediate" setting and times already in the past will always cause the added step to fire the next day. To send the added step the same day set the time to a future time. Last Step for contact fired two hours ago. You add a Step set to go out three hours after the previous Step. Step fires three hours after the previous Step, so one hour from the time you add it. The account's time zone is used for the timing of this step. Contact is at end of Step Sequence. It's 6 P.M. You add a Step set to fire at 5:30 PM. Step fires next day at 5:30 PM. The account's time zone is used for the timing of this step. Contact is at end of Step Sequence. It's 6 PM. You add a Step set to fire at 6:30 PM. Step fires same day at 6:30 PM. The account's time zone is used for the timing of this step. Contact has been at the end of the Step Sequence for three days. You add two steps, each set to fire 1 day and 10 hours after the last step. The first additional step will fire at 10 AM in the account's time zone the following day. The additional step will wait 1 day and 10 hours after that to fire (steps following the first added step fire normally). Open the Step Sequence for editing. Add the step to the sequence. When satisfied with the edited Step Sequence, click Save. Remember to select the Step Sequence in the collections view again and select Resume from the Actions menu. These steps are necessary to prevent contacts from progressing to the new step after it is added, then being moved with that new step into its new location. To remove a step, scroll to the right where the steps are listed -- there's a little trash icon. This program frustrates the s******t out of me!!!!!!! How can i run automatically the same step every 7 days ? The following sequence is created. After the second time it will be sent at 23 o'clock. Is it impossible to specify time by step mail?